Minnesota Vikings player Adrian Peterson has been reinstated by the NFL after serving a five-month ban for "recklessly assaulting" his son. 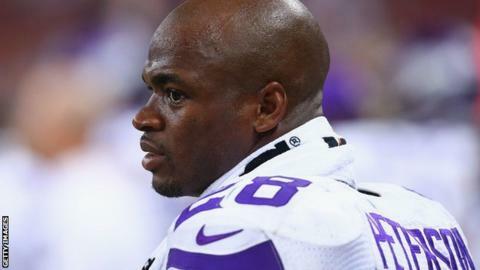 In November, Peterson, 30, pleaded no contest to the misdemeanour charge of assaulting the four-year-old before being banned without pay by the league. Peterson will be available to the Vikings from Friday, but must fulfil ongoing "counselling and treatment". The NFL said further violation could result in "suspension" or "banishment". The running back won the NFL's Most Valuable Player award in 2012 and is seen as a key figure for the Vikings, where he is under contract until 2017. They begin their new season in September and said they "look forward to Adrian re-joining", in a brief statement on Thursday. Peterson used a wooden implement to discipline his son in the Texas town of Spring in May. The footballer was said to have punished his son after the boy pushed another of his children off a motorbike video game.